This is an outfit my husband’s sisters wore when they were babies! This is a summary for Brinley’s 30th week. She was 29 weeks old. Oh she was grumpy this week! Just not happy for long with toys, getting upset when I walked out of sight…I wondered if it was a wonder week, but I never did get around to looking it up, so I am unsure. She was also STILL teething. She also stopped rolling this week (from tummy to back). I had her on the wood floor and she isn’t graceful about it yet, so she bonked her head rolling over a couple of times and then gave it up. But she did start rolling to her tummy during sleep sometimes…and go back to her not rolling over anymore and we have an issue. She won’t put her head to the side and lay down; she tries to sleep on her face. That of course makes you a bit nervous! Right now, we are rolling her back to her back. She woke the next morning with both arms out and was fine, so I decided to go cold turkey. We just stopped swaddling all together. She has done great with it! We are officially swaddle free! Since I have been analyzing and watching for signs for dropping since last October, I am so glad to have that behind me and out of my head. This week, we added carrots to her diet. I wouldn’t say she LOVES them, but she did eat them without any fruit added, so I would say she likes them. Notice our solids food change in the evening in the listed schedule; I started her getting solids with her third nursing instead of in between the nursings. I gave her her first wagon wheel this week. She definitely loves that. She bites off pieces, and then she would gag. Not for the faint of heart! She figured it out, though. hi, what do you mean by oatmeal mixed in? do you add the powdered flakes (like gerber oatmeal cereal) or prepare oatmeal separately then mix? my 7.5months old is still not sleeping through the night and very random about eating solids (some days she eats, others she pushes the spoon away) so I'm interested in to see if she would like some oatmeal to make it thicker/tastier? Hi-thanks for your blog. I'm not sure where to post this. I have a 7 1/2 month old daughter, and we are having issues with naps and going to sleep. It started a couple months ago when she started teething(she also has been rolling over since Dec. and scooting since Jan.- maybe part of the problem? Anyway, she used to sleep at least 2 hours for her 1st nap, but now I can only get 1 hr 20 min. out of her (waketime is 1 hr 40 min, any less or more and her nap is shorter). Then her next 2 naps she won't fall asleep! She just lays back and plays, talks, fusses forever(I have started going back there to help her go to sleep by rocking her-I know this is probably bad, but don't know what else to do). I want her to get some rest. Also, at bedtime she has the same issue, but is pretty fussy. Sometimes she will fall asleep only to wake a 1/2 hr later very upset. I end up rocking her, and she will sleep 10-11 1/2 hrs. I have tried many different waketimes, tylenol(I think shes teething again). I thought maybe she needs to drop a nap, but she gets up at 1:30ish from her 2nd nap and thats way too long for her to be up before bedtime(7:30). Do I need to just leave her be and let her CIO? Help! Any suggestions would be great! Sorry this is so long! Thanks! My baby is three weeks older than yours. Although, she is always behind on her babywise milestones. That's not her fault, but her mother's. 🙂 I always enjoy your blog. My question is: Does your baby really sleep 19 hours per day? or is part of that nap time acutally prepping time? Have you ever talked about what to do if your baby doesn't follow babywise, no matter how hard you tried? My son only napped for 30 min, so I didn't want him to get use to eating when he woke up every hour (snacking?). 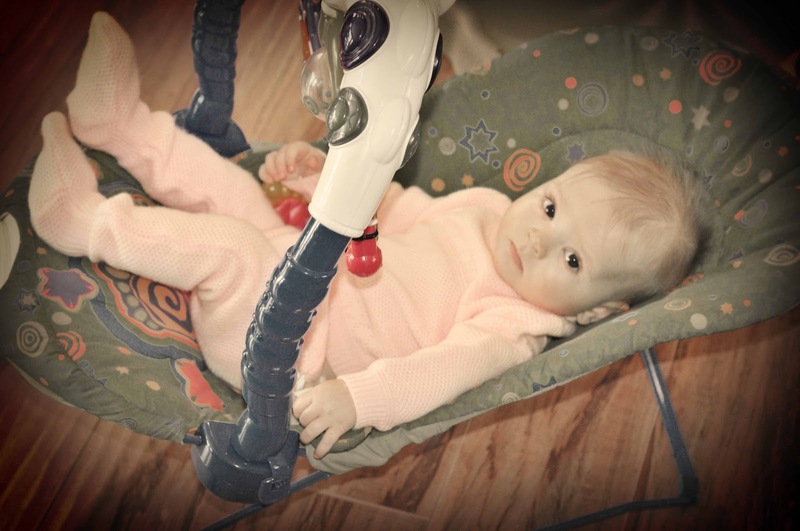 Could you write a post about troubleshooting, when your child doesn't take "babywise" naps? or fit that schedule? EstradaMommy,I just put the flakes in with the fruit/veggie and breastmilk. With Brayden, I fed him oatmeal separately because he really enjoyed it. I did the same with Kaitlyn. With McKenna, I started trying it just mixed with the foods and it worked well. I think it can help "soften" the taste of the food so it isn't so strong. leah haas ,It could be teething, but if you give pain killer and that doesn't help, I would think that isn't it. What it really sounds like to me is that waketime length needs to be a bit longer, but you said you tried that and it doesn't work. Playing before nap is classic sign that the baby needs to be awake longer before nap time. Shannon, she used to not be hungry for solids after the third nursing. Plus I used to do an additional nursing between the current third and fourth ones, so I did solids with that one because at the time, it was closer to when we eat dinner. Now, her third nursing is later in the day, so it is now closer to when we eat dinner as a family. She also now eats the solids well at that time. Robzwife,She sleeps 12 hours at night, 2.5 hour nap, a 2.5 hour nap, and about a 30-60 minute nap. So that is 17.5-18 hours. I notice that you give Brinley some finger foods like wagon wheels and biter biscuits. Does she have any teeth yet. I was hoping to start giving my 6 1/2 month old finger foods but she has no teeth yet.Thanks for all of your help with your blog. Jennifer, nope, no teeth. They don't need teeth for it. The teeth they get are for biting anyway, so it doesn't help with chewing foods. You just make sure the food can be gummed. You can test it yourself by putting it in your mouth and mashing it with your tongue. I think I have a post on good first finger foods, too. I like the commercial ones initially because they dissolve quickly, but then we move toward real food. There is also something called "baby led weaning" that might interest you and I have a post on that, too.